Avishai Ehrlich critiques Emmanuel Farjoun's article Class divisions in Israeli society, particularly Farjoun's claim that Oriental Jewish rejection of the Israeli centre-left is one made as a class. 1. That this support is neither dependent on Begin’s national or economic policies nor is it an indication of agreement with these policies. 2. That the protest is an expression of (working) class antagonism against the Labour corporate bureaucracy. To prove the first point, Farjoun argues that: (A) Begin’s Oriential supporters voted for him despite his economic policy which affected them adversely. (B) That the return of Sinai was more popular with the Orientals than with the Ashkenazim. (C) That the poorer sections of the Oriental community which support Begin are also against his policy of massive colonisation of the West Bank. These arguments are incredible and spurious to say the least, as they fly in the face of known facts. 1. In contradistinction to most right-wing governments in the present world crisis, Begin’s government has continued and increased government deficit spending. This has exacerbated the balance of payments situation and the foreign debt; but, together with a sophisticated system of indexation which exists in the country and other welfare mechanisms, it has enabled most of the population to retain and even increase their standard of living. Moreover, this high-inflation policy allowed the government to maintain a very low rate of unemployment (about 4 per cent) among Jews. The main attack by Labour on Begin’s policy was that it was mortgaging the future for short-term benefits. These benefits, among others, included the satisfaction of the economic interests of his supporters. Farjoun argues that they voted for Begin despite suffering economically under him; but in fact they voted for him because they would have suffered more under Labour. 2. To argue that the Oriental community was more in favour of the return of Sinai, as part of the peace agreement with Egypt, than the Ashkenazi community is also unfounded. It is, however, correct that the extreme right movements which were against the withdrawal (the Revival Party, Gush Emunim, the Jewish Defence League, etc.) are mainly Ashkenazi in composition. This fact, nonetheless, is only half the truth, because the other half is that the organised support for the return of Sinai and for the Sadat agreement was also mainly Ashkenazi in composition (the Peace Now movement). There was never a wide public movement among Orientals for the withdrawal from Sinai prior to the agreement. The unpleasant truth is that most Oriental public opinion passively trailed behind the official policy. 3. With regard to Oriental attitudes towards the massive colonisation of the West Bank, it is again correct that in the first phases of colonisation most of the settlers were supporters of the extreme right which is, in the main, Ashkenazi. However, so was, and is, the opposition to the colonisation. Zionist pioneer settlement of frontier zones was always carried out by ideological movements which were Ashkenazi. Once the framework was established, Oriental Jews were brought in. This was the case with the newly occupied territories after the 1948 war, when the first to move in were kibbutzim; and only afterwards was the area densely populated by villages and ‘development towns’ whose inhabitants were mostly Oriental. The pattern recurs at present with one variation. With the exception of the Golan Heights, the kibbutz movements, which are mainly Ashkenazi, were reluctant – for political reasons – to be the vanguard of settlement in the occupied territories. Their pioneering role was taken by new movements of the political ‘right’, also mainly Ashkenazi. At present, the Begin-Sharon government has entered into the second phase of the settlement and absorption of the West Bank. Massive building of urban and semi-urban neighbourhoods is being completed. These apartment blocks are offered at cheap, heavily subsidised, prices to young families; and those finding housing a major problem, mainly Orientals, are beginning to flock in. It will not be long before the West Bank (which, with the exception of Jerusalem, has so far been sparsely populated by Jews) will have a much larger Oriental Jewish population. In this way the accusation that the settlements divert funds which would otherwise go towards improving the conditions of Oriental Jews is being averted. The government argues that the solution for the Oriental urban poor is in their settlement in the West Bank. The claim that there is wide Oriental opposition to the settlement of the West Bank is unfounded; only marginal Oriental groups (supporters of the Black Panthers etc.) have raised their voices against it. An even greater willingness to move to the West Bank is only checked by the lack of employment in the immediate vicinity of the new settlements, which compels the settlers to commute. Summarising, I have shown that Farjoun’s argument that Oriental support for Begin is economically altruistic is simply wrong. Also unfounded is the implication that the Oriental supporters of Begin have positive attitudes towards withdrawal from the occupied territories and are against their settlement. 1. That in the public sector Orientals and Ashkenazim face each other in antagonistic class relations: semi-skilled and skilled labourers against supervisory, managerial, corporate bosses. 2. That the main way towards upward mobility for Orientals was through entrepreneurship in the private sector. These upwardly mobile sections of the Oriental community relate with antagonism to the public sector, where their mobility was restricted, and thus identify with the party of the private bourgeoisie. Here too the claim is that the support for Begin is due to his being Labour’s opponent rather than because of what he actually stands for. Farjoun and I share the view that a class analysis of Israeli society must include both the ethnic and the national divisions. A class analysis of the Israeli social formation must account for the inter-relationship and changes in the triangle: Occidentals-Orientals-Palestinians. Farjoun’s conclusions are based on a concentration on just one pair of relationships within the triangle: the Occidental-Oriental couple, and ignore the Oriental-Palestinian, Occidental-Palestinian couples. It is my contention that his conclusions are the result of an incomplete analysis. 1. The price of unskilled labour-power will tend to decrease. 2. The differential between the prices of skilled and unskilled labour-power will tend to increase. 3. The ratio of cost of labour versus cost of capital will decrease – encouraging labour-intensive processes of production. 1. A wider differential of labour prices between the two sectors. 2. A tendency to increase capital-intensive processes of production. These simple theoretical conclusions are of particular significance in the class analysis of Israel. They account for some of the consequences of the segregation of the Jewish and Arab economies in Palestine in the pre-state period; they are also fruitful for the understanding of the impact of waves of immigration to Israel, in particular the Oriental immigrations. Since 1967 they are important for understanding the impact of the absorption of the Palestinian labour force and they are also illuminating for the understanding of the relationship between the kibbutz sector and the rest of the Israeli economy. 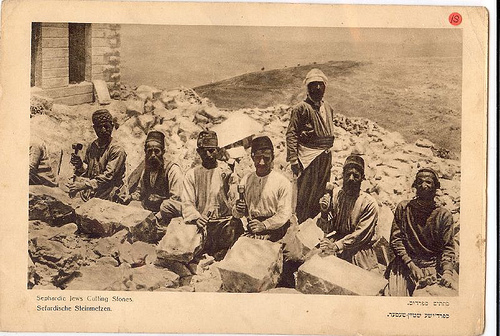 What were the main consequences of the absorption of a large Palestinian labour force on the Jewish working class? In the private sector the new source of cheap labour made it possible for larger numbers of Jews, Oriental and Occidental, to move from positions of employees to becoming employers. These very small capitaist enterprises stand or fall on the continued supply of cheap Palestinian labour. The 1967 occupation signified for them the opportunity to move out of the working class. At the other end of the labour force there was a fraction of the Jewish working class, almost entirely Oriental, which was unskilled. The introduction of cheap Palestinian labour threatened to further reduce their wages. To mitigate the effects of this competition, the Histadrut and the Ministry of Labour intervened to enforce basic minimum pay rates, but only where the workforce was mixed. The main trend, however, was towards the division of labour along national lines, which opened channels of upward mobility for Jews within the class. In the segregated sector of the Israeli economy, where Arabs are not admitted, the effects of the Palestinian workforce were indirect. It made the supply of the Jewish labour force more scarce and thus increased the pay differentials between the Jewish and mixed sectors. The scarcity of labour and its high price was also a cause for capital- intensification, which itself increases the demand for more skilled labour thus raising the differentials even further. It is possible to argue that this sector of the Jewish working class also benefited from the incorporation of Palestinian workers into other sectors of the economy. Although the effects of the incorporation of Palestinians on the Jewish class changes require more research, it is easy to see even from the above sketch that the Jewish working class, not only the bourgeoisie, benefits from the incorporation of Palestinians into the economy and has an interest in the continuation of this situation. The converse is also true: wide sections of Jewish working class and new small capitalists have much to fear in terms of personal status, incomes and mobility from the discontinuation of Palestinian employment. To the extent, therefore, that the Labour Party is perceived as willing to negotiate Israeli withdrawal from occupied territories, this is seen as a socio-economic threat to these sections. On the other hand, Begin’s stance – no return of the territories – coupled with actions to make the separation of the West Bank from Israel impossible, is in line with their material interests. There is no contradiction between the hostility of many Oriental workers to the Labour bureaucracy and their interest in maintaining the Arab labour force. Indeed, some, mainly the new Oriental entrepreneurs, may combine the two, as they may well imagine that the return of the territories would necessarily mean the stoppage of mass Palestinian employment in the Jewish economy and that this could create a return to the situation in the 1950s, where in the absence of Arabs they themselves were forced into the lower echelons of the working class, subordinated to the Ashkenazim. The view of many Jewish workers that they do benefit from the incorporation of Palestinians into the economy may lead them to object to the return of the territories but also to be against massive expulsions of the majority of the Palestinians. Thus, not many workers support the most extreme right, fascist movements who call for the expulsion of Palestinians from ‘Greater Israel’. Both extremes of Zionism have in common the aspiration of Israel as purely Jewish. The difference is in the method, and the scope of what is seen as Israel, but not in concept. The interest in permanently retaining the Arab labourer in the Jewish economy as a subordinate presupposes the open and formal institutionalisation of an unequal status to Arabs – discriminated, but tolerated. I have tried to show that Farjoun’s analysis is incomplete, that wide sections of the working class and of new small capitalists support Begin, not just against Labour but also positively endorse what he stands for. Furthermore, that there is no contradiction between a protest against Labour and a positive support for Begin’s policies. Is the Oriental reaction a particular class antagonism? Farjoun claims that it is so, but this is very much a matter of an operational definition. To reach his conclusion, he conflates the Orientals and the working class; and simultaneously, to create the ‘class’ enemy, excludes Occidentals from the working class. If we define the working class as those who do not own means of production and make their living by selling their labour power, we still find that a majority of Occidentals are workers, perhaps highly skilled, professionals, perhaps not proletariat, not in the productive sectors but workers nonetheless. At most we could say that Occidentals and Orientals are differentially distributed in various fractions of the working class. This argument echoes a current debate among Marxists, whether to define the working class minimally or maximally, a debate which reflects the complex division of labour in advanced capitalism as well as different political strategies. One of the effects of the incorporation of the Palestinian labour force into the Israeli economy has been to open up and diversify the class composition of the Oriental communities. It is now less correct to assume a class homogeneity of Oriental Jews than it was at any time since their arrival in Israel. It would be of interest to find out whether the Oriental supporters of Begin, a subset of the Orientals, are concentrated in particular class positions, whether these positions are mainly working class and in particular in which fractions of the working class. The concepts ‘lower’ and ‘middle’ echelons are inadequate; they mean, presumably, lower and middle income groups – but this is not a particularly Marxist criterion of class determination. I have doubts as to whether the staunchest supporters of Begin among the Orientals are also the most proletarian elements among them, that is, workers in the productive sectors of large industry. To be precise, I do not argue that the Oriental support for Begin is not a protest against the Labour Party; it probably is. What I question is whether this is a class protest. My criticisms have been confined to Farjoun’s two main theses, but his article is unclear on wider issues. It is not clear whether it wishes to explain the causes of Begin’s ascent to power or whether it only confines itself to explaining the Oriental vote for Begin. This vote is only one, albeit important, reason for Begin’s rise but it is by no means the only one. Begin’s first government of 1977, the watershed point which signified the breakdown of Labour hegemony, was made possible not just by Oriental protest but by the protest vote of Occidentals for Yadin’s Democratic Movement for Change, and by the deep transformation in the ranks of the religious bloc of parties – traditional coalition partners of Labour which deserted it. These shifts as well as the continuous crisis of Labour still require proper analysis.